One of the most time-consuming, yet important, tasks of any do-it-yourself project is estimating your materials needs. If you are pinching pennies, figuring your requirements precisely ensures you don't end up with a lot of wasted wood and other materials at the end of the job. Most construction materials in the U. S. come in standard sizes that work together efficiently, so that with basic math skills, a tape measure and a bit of common sense, this job need not be difficult. 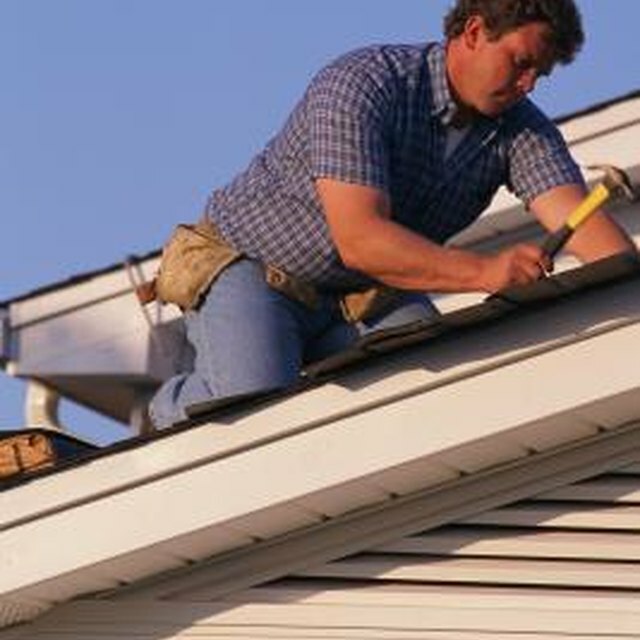 Building or repairing a roof requires careful planning. Measure each plane of your roof to find the area in square feet. Multiply the width times the length for each section. For example, a roof section that measures 30 feet by 50 feet would have an area of 1,500 square feet. Write down all the numbers as you go so you don't lose track. Add together all the roof sections' measurements to get the total area you need to cover. Divide the total roof area by 32 – the area of one sheet of 4-by-8-feet plywood. The resulting number is the number of plywood sheets you need for one layer of decking on your roof. For example, 1,500 square feet divided by 32 square feet equals 46875 sheets. Round to the nearest full sheet – in this case 47 – for the number to purchase. Remember to include any overhanging areas, or eaves, in your calculations. It is always a good idea to buy a few extra plywood sheets to allow for mistakes or miscalculations. Use this same method to calculate your other roof sheathing materials, like roofing paper or shingles – dividing the total roof area by the square footage contained in a roofing paper roll, “square” of shingles, or whatever material you will use, as appropriate. When attaching plywood decking, stagger the seams for greater strength. Place one sheet over two, with the joint of the lower two meeting at the midway point of the sheet above, and the two above that one meeting at the midway point -- in a two-over-one / one-over-two pattern similar to brickwork -- and so on, across the roof. Check your local building codes and use the same thickness of plywood over the entire roof for best results. Building codes vary from place to place, but the recommended thickness for roof sheathing is usually 7/16-inch or thicker.